Take a walk through the British Museum in London and you will see galleries full sculptures made of white marble or blackened bronze. But antiquity wasn’t black and white: it was much more colourful than we imagine. ‘Our idea of white marble sculpture is based on neo-classical aesthetics,’ explains British Museum scientist Joanne Dyer. ‘But this is a misconception: it would have been a very colourful world, from ancient Egyptian times to the Classical period in Greece and through to the late Roman period.’ With time, this colour has faded or completely disappeared, leaving us with a false impression of a monochrome antiquity. Today’s museum scientists are trying to change this, through careful conservation, analysis and reconstruction of the polychrome past. The quest to identify colour from the past has not been helped by yesterday’s collectors. Dyer says the Victorians were fixated on the idea of white sculpture. ‘There was a lot of scrubbing going on to make sure that things were white. In many cases, the remnants of polychromy that we see are in the areas that were not accessible to people with wire brushes. We can see it under encrustations, in folds of garments or areas that were obscured and people weren’t able to clean’. The deterioration of surface polychrome layers is not only a problem for works of art from European antiquity – the famous Terracotta Warriors of statues surrounding the tomb of China’s Emperor Qin Shihuang (259–210BCE) is another example of the use of colour. 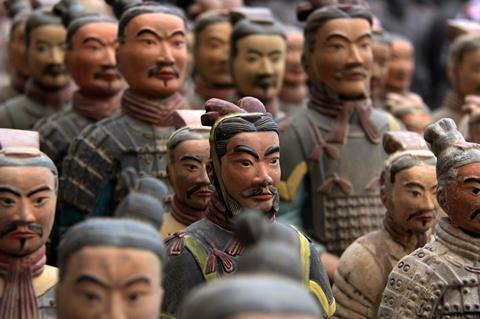 The museum at the site in Shaanxi province, Northwest China, displays rows of grey soldiers, archers and charioteers, but the original statues were colourfully painted. Working out how to conserve these polychrome surfaces has been difficult. In the first excavation of the Terracotta Warriors pits in the 1970s, exposed paint quickly flaked off the figures, sometimes in minutes. This is because of the way the statues were made. ‘Ceramics for practical use, for drinking and cooking, were painted and then fired, but the terracotta army was just for burial and not for use,’ explains Xia. The ceramics were first fired and then covered with qi lacquer – a processed tree sap that made them a brownish colour and the ceramic very smooth and easy to paint according to Xia. But the lacquer is sensitive to humidity changes and on excavation without treatment it dries, shrinks and falls off, taking the surface colour with it. 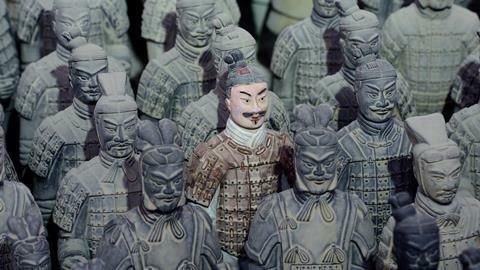 In the 1990s, Terracotta Warriors conservators began working with chemists from the Technical University of Munich to come up with a method for consolidating the complex polychrome surfaces on excavated warriors. All of the statues are excavated in fragments, sometimes hundreds, that must be reconstructed after treatment. The dense blackened lacquer makes commonly used UV-cured consolidants unsuitable. An alternative has been spraying the terracotta with polyethylene glycol (PEG). This anti-shrinkage agent, widely used in cosmetics, replaces moisture in the lacquer, but makes the figures darker than they were originally. Cracks can appear if moisture evaporates faster than the solution is applied. Organic chemist Heinz Langhals from the University of Munich came up with an alternative method using the monomer hydroxyethyl methacrylate (HEMA), which is small enough to penetrate into the lacquer pores and firmly link the polychrome surface to the underlying terracotta when polymerised by electron beam irradiation. The high density of polar hydroxy groups on the monomers helps penetration and replacement of water molecules. Langhals also added another monomer, glycerol methacrylate (GMA), with a polymer crosslinker. In more recent years, the museum has concentrated on developing on-site conservation protocols to temporarily consolidate excavated material on site, which can then be removed for long term treatment in the laboratory. ‘Several years ago we used gypsum but it is very heavy and easily broken, so we now use cyclododecane and menthol,’ explains Xia. Both cyclododecane (C12H24) and menthol (a cyclohexanol derivative) are waxy solids that can be removed by sublimation, making them perfect temporary supports. Statues excavated more recently, where polychrome surfaces have been conserved, show vivid colours – red, violet, pink, white, blue and green – from a range of inorganic minerals. There is also evidence of synthetic blue and purple barium copper silicate pigments, the first synthetic blue used in China (from 700BCE to 220CE). Xia and colleagues analysed a variety of these pigments known as Han blue and Han purple , as well as a lighter blue variant and suggest they were synthesised, often together, from quartz, malachite and barium minerals such as witherite (carbonate) plus a lead salt catalyst. Where colour has been lost, is it possible to realistically reconstruct the original look? Returning to a Western context, Dyer says there are several clues. ‘If you see Egyptian blue in an object, it’s usually a very strong indication of a polychrome surface.’ Egyptian blue is another example of an ancient synthetic pigment, but a calcium copper silicate (CaCuSi4O10 or CaOCuO(SiO2)4) made in Egypt during the third millennium BCE until the end of the Roman period. ‘It’s not only used as a pure blue pigment, it’s also used in mixtures very often to create other colours or hues, or as an optical brightener (as in the whites of the eyes of mummy portraits). Even in sculpture, you see it used as a highlight or for contouring. So it’s a pigment that also lends itself very well for us to study ancient painting techniques,’ says Dyer. Where Egyptian blue is not obviously visible it is possible to detect it using visible-induced infrared luminescence (VIL) – a technique developed at the British Museum in the last decade. ‘Egyptian blue has this particular property that when you shine visible light on it, it emits IR luminescence and we can capture that IR luminescence using a modified camera,’ explains Dyer, herself originally a photochemist. The method uses a normal digital camera with its filter removed (known as a ‘hot mirror’, this protects the optical system by reflecting infra-red light whilst allowing visible light to pass). By using filters in front of the camera lens, different wavelength ranges can be recorded, in the case of VIL, the infrared (700–1100nm). Interestingly, the Han blue and purple found on the Terracotta Warriors are the only other pigments that exhibit the same luminescence properties as Egyptian blue, being chemically related, with barium substituted for calcium in Han blue and purple. The technique has become incredibly useful for revealing hidden colour. Dyer says she is often surprised by what she finds. She worked on a sculpture of the falcon-headed god Horus, dated first to third century CE, using VIL imaging to detect Egyptian blue. ‘It was limestone, which is a really friable surface, so I wasn’t expecting to see Egyptian blue and I thought “If it was ever painted, there would be nothing left” – but that’s the proof that you can never take anything for granted,’ she adds. FTIR and Raman spectroscopy identified other pigments and Dyer and her colleagues were able to propose a colour reconstruction - a startlingly bright image that confounds our expectations. Organic colorants are more difficult to identify, including a group known as lake pigments, where the colorant is precipitated on an inert carrier – usually a metallic salt. One such red lake was traditionally derived from madder root, which on fermentation produces the sugars alizarin and purpurin. When treated with alum they give a brilliant red colorant. It’s difficult to detect such dyes with techniques such as x-ray fluorescence due to the absence of heavy metals, but they can be imaged using ultraviolet-induced luminescence (UVL) in the visible region (400–700nm). ‘Rose madder or pink madder absorb UV and luminesce in the visible region, with a very characteristic pink–orange luminescence, so this is a strong indication that madder is present. Sometimes it can be a few grains that aren’t visible to the naked eye,’ says Dyer. Ørsted Brandt is starting a major project to identify the range of binders used in polychrome antiquities by protein sequencing. She is working with the Centre for GeoGenetics at the University of Copenhagen and looking at material from the Ny Carlsberg Glyptotek museum in Copenhagen. ‘What we are hoping is that we can find out exactly what proteins are there, but also the range of species that they come from,’ says Ørsted Brandt. Using mass spectrometry-based peptide sequencing, a pilot study has identified several types of bovine collagen (by comparison to standard databases) on a painted architectural fragment of the Egyptian Palace of Apries in ancient Memphis. The problems of fading colours are not the preserve of ancient art – modern paintings also experience colour loss, changing our perception of even 19th century art. Chemist Marco Leona of the scientific research department at the Metropolitan Museum of Art in New York, US, has seen this in the paintings of Vincent van Gogh (1853–1890) that his colleague Silvia Centeno studied for a 2015 exhibition at the museum. Van Gogh was a fan of the vivid scarlet ‘geranium lake’ pigment derived from the synthetic dye, eosin. Even at the time it was known to fade. He compensated by using it more intensely, but was ultimately unable to hold back the photochemical tide. Today, the washed out colour in a number of his paintings does not represent his intended colouring. The Metropolitan Museum has produced technical studies of several van Gogh paintings to map the presence of faded red lakes. Digital reconstructions from a range of analytical data can give an impression of the original intended effect. To reveal the polychrome secrets of art from the past, museums are making use of increasingly sophisticated non-destructive methods. One of the most useful for looking at colour is surface-enhanced Raman spectroscopy (Sers). ‘At this point we have used it on several hundred case studies,’ says Leona. Raman spectroscopy, the analysis of scattered monochromatic light due to molecular excitations, has been used for identifying pigments from the 1990s but the more sensitive Sers allows results from 20–50µm samples – around the width of a human hair. Sers takes advantage of the signal amplification that occurs when samples are absorbed onto a silver nanoparticle, generally in the form of a silver colloidal suspension. ‘We put a small drop on top of the sample,’ explains Leona. ‘The interaction between the electrons on the surface of the metal and the electrons in the [colorant] molecule can lead to particular resonance phenomena in the molecule and with the right laser wavelength leads to enhancement of the Raman spectrum emitted.’ To make the technique what Leona calls quasi-non-destructive, gels are now used that when placed on an art work will absorb enough dye molecules to then be detected using Sers. Leona says the Metropolitan Museum is now experimenting with laser ablation and collecting the ablated material on a quartz window covered in silver nanoparticles to be analysed, ‘By doing this, we can restrict the sample spot to 10µm,’ he explains. 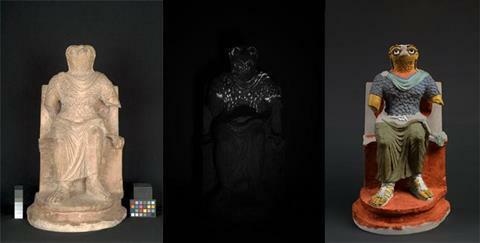 Thanks to the efforts of conservators and museum scientist we are starting to develop a more realistic idea of how colour was used throughout history. In some cases, reconstructions can seem bright and garish and jar with our modern sensibilities, but in the ancient world, Dyer suggests, colour would probably have been judged in a different way. Analytical science can help us abandon our preconceptions and really glimpse the colourful past.